Oh Hey There! 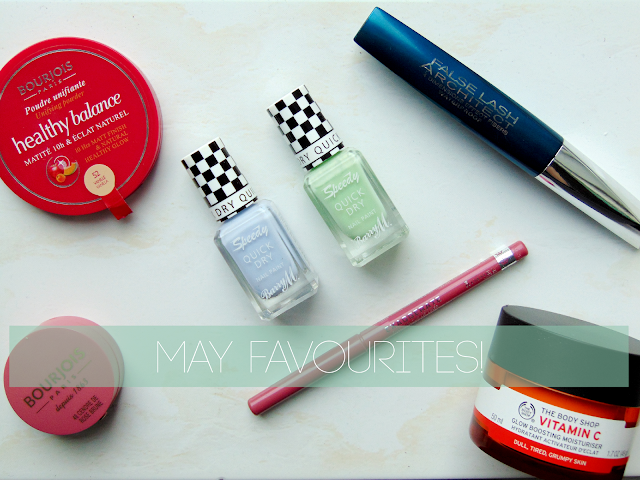 : Beauty || May Favourites! Left to Right: Bourjois Little Round Blush Pot in No.48 Rose Brune, Bourjois Healthy Balance Powder in No.52 Vanilla, Barry M Speedy Quick Dry Nail Paints in Eat My Dust and Pole Position, Rimmel Exaggerate Lip Liner in Eastend Snob, Loreal Falsh Lash Architect Mascara & The Body Shop Vitamin C Glow Boosting Moisturiser. I feel like this month has really been a back to basics month. No fancy skincare, no weird or wonderful products, just your basic, staple products from the highstreet. I have actually really enjoyed this and love how affordable everything has been! This month, in terms of face makeup, I have really been loving the Bourjois Healthy Balance Compact Powder. It is great for setting makeup but doesn't look at all cakey. It goes on really lightly making it nice and buildable. I won't say much more as I have already reviewed it but as usual, Bourjois have done a great job. I have also been using the Bourjois Little Round Pot Blush in No. 48 Rose Brune. This is such a classic product but for some reason have never owned one! Small, compact and great for travelling but there is still a good amount of product. It is really pigmented and comes in so many different shades, there is something for everyone. The shade Rose Brune is perfect for me. Pinky, which goes with my complexion but with browny undertones, calming it down a little. I found out recently that a lot of people say there is always a breaking in period with new mascaras and thinking about it, it is so true! At first, I didn't like the Loreal False Lash Architect Mascara. I couldn't put my finger on why though so I slung it aside. But when my current mascara had completely given out, I had to use it. And the more I do the more I like it. It is a fibre mascara, which means it great for thickening and does help give the false lash effect. It also does a great job at lengthening but still manages to keep lashes curled. Another product that has been growing on me this month is the Rimmel Exaggerate Lip Liner in the shade Eastend Snob. I am not great with lipliners and I always forget about them. But have been trying to convert myself and I think I have found a great one to start with. It is good quality, pigmented and doesn't smudge easily. For the price, I think its great and there is a nice shade range too. What more could I want? So, it seems I cannot go a month without finding a new Body Shop product to love and this month it has been The Body Shop Vitamin C Glow Boosting Moisturiser. I reviewed it recently and gave it glowing review (see what I did there?) which you can check out here. It is has been so nourishing for my skin but is still very light. I have also seen a real improvement in how my skin feels. It also created a really nice base for my makeup and smells amazing! Barry M are probably my favourite nail brand. I like having painted nails but its also not something I want to spend very much money on. So I always head to Barry M. I know that the products are always decent quality and they do such a good range of products for a brilliant price. The Speedy Quick Dry Nail Paints are something that immediately caught my eye as I am so impatient and ALWAYS smudge my nails. I was a little sceptical and although you need a good two or three coats, they dry so quickly that you more than make up the time! The shades I have been using are Eat My Dust and Pole Position which I have been alternating between all month. Do you have any monthly beauty favourites for May? I really want to try those dry quick Barry N nail polishes. I love the brand & I hate sitting still waiting for my nailpolish to dry! Eat my days has been on my wish list for so long, it's such a pretty colour! I've been hearing so much about the Bourjois "Healthy" range and was tempted to buy the healthy mix serum foundation from there. 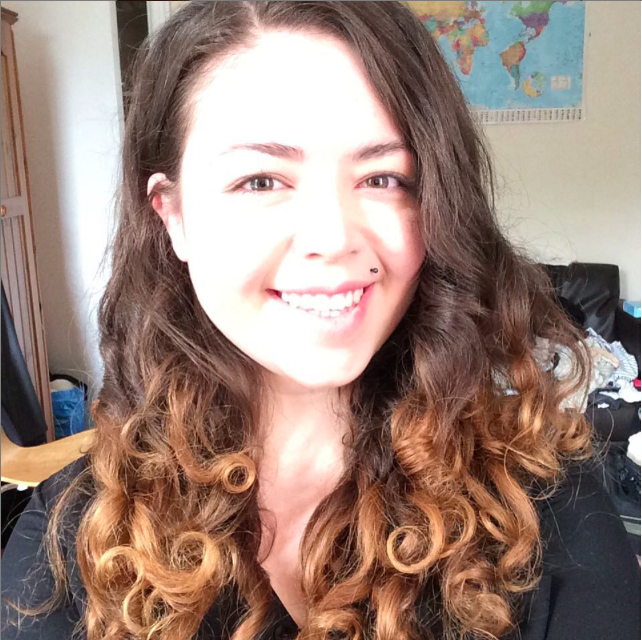 I used to have the Healthy Mix foundation years ago and have completely forgotten whether I liked it or not! Very tempted to give it another go for summer though! i love those colors, i really want a baby blue nail polish.Right now I'm loving my solvaderm acid ferulic and vitamin C serum. Its great! I can't believe its taken me so long to try it!